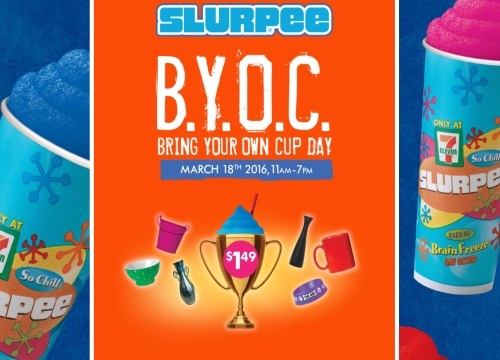 7 Eleven is having a BYOC Slurpee Day today! Bring in you own cup and fill it with a slurpee for only $1.49. This is a one-day promotion today only, Friday, March 18 from 11am-7pm. a. Slurpee Cup must fit inside the magic measuring hole/device displayed in store. b. Container used for this contest must fit within a 26 cm diameter'. Cups when full must fit within a specific size limit: 26cm wide x 26cm high. c. Container must be able to withhold liquids. d. Cups must be hygienic, clean, watertight (no drips or leaks allowed), and fixed in size and shapes (no inflatables). e. One container per customer per day. No refills allowed. f. Container must be food safe clean of any contaminants. g. Individual Stores and its staff have the right to restrict containers should there be any deemed Food Safety issues, or matters such as cleanliness, impacted health regulations, type of cup, or size of cup.